FOUND IN: Skin lighteners, facial and skin cleansers, facial moisturizers, hair conditioners, finger nail coating products. WHAT IS HYDROQUINONE? Hydroquinone is marketed most aggressively to women of color for its whitening ability in skin creams. The chemical is allowed in personal care products in the United States in concentrations up to two percent. Although banned in the European Union, a UK news report found that products containing hydroquinone were relatively easy to procure. In addition to its use in skin lighteners, hydroquinone is a possible impurity of tocopheryl acetate (synthetic Vitamin E) which is very common in facial and skin cleansers, facial moisturizers and hair conditioners. Cancer: Hydroquinone works by decreasing the production and increasing the degradation of melanin pigments in the skin. This increases the skin’s exposure to UVA and UVB rays, increasing the risk of skin cancer. Organ-system toxicity: Hydroquinone is linked to a skin condition called ochronosis in which the skin (our largest organ) thickens and turns bluish-grey. Exposure of the eye can cause pigmentation and permanent corneal damage. Respiratory Tract Irritation: Hydroquinone may be harmful if inhaled, causing irritation of the nose, throat and upper respiratory tract. A study on occupational exposure of hydroquinone showed that subjects exposed to hydroquinone had a higher prevalence of a cough and decreased lung capacity compared to their unexposed counterparts. VULNERABLE POPULATIONS: Anyone is vulnerable to the effects of hydroquinone, but skin lighteners are marketed to women of color. REGULATIONS: Banned from cosmetics in the European Union; restricted use in Canadian cosmetics. 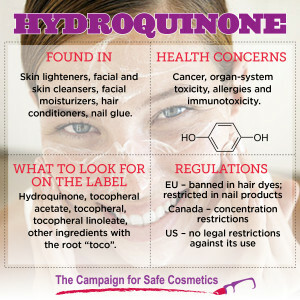 The U.S. Cosmetics Ingredients Review Panel indicates that hydroquinone is unsafe for use in products that are left on the skin, but because of lax enforcement, directions for skin-lightening products containing hydroquinone encourage frequent and consistent use on the skin.,, It has been recommended to the National Toxicology Program (NTP) for further studies. 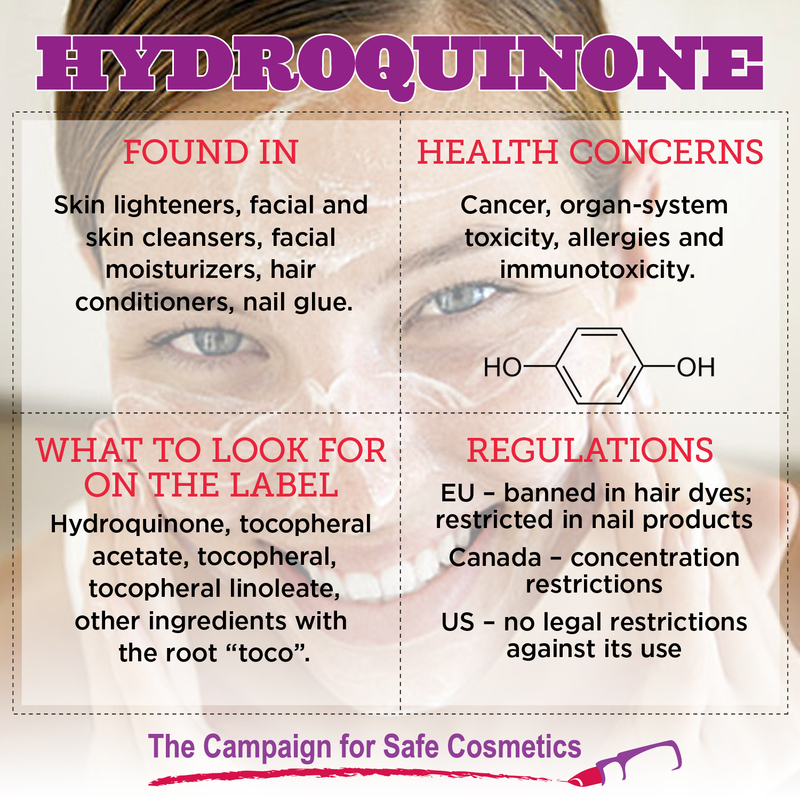 The FDA continues to allow the availability of products containing hydroquinone in OTC drugs. Zondlo, F. M. (2002). Final report on the safety assessment of Tocopherol, Tocopheryl Acetate, Tocopheryl Linoleate, Tocopheryl Linoleate/Oleate, Tocopheryl Nicotinate, Tocopheryl Succinate, Dioleyl Tocopheryl Methylsilanol, Potassium Ascorbyl Tocopheryl Phosphate, and Tocophersolan. International journal of toxicology, 21, 51. Jimbow, K., Obata, H., Pathak, M. A. and Fitzpatrick, T. B., 1974. Mechanisms of depigmentation by hydroquinone. Journal of Investigative Dermatology 62, pp. 436–449. Findlay, G. H., Morrison, J. G. L., & Simson, I. W. (1975). Exogenous ochronosis and pigmented colloid milium from hydroquinone bleaching creams.British Journal of Dermatology, 93(6), 613-622. NAUMANN, G. (1966). Corneal damage in hydroquinone workers: a clinicopathologic study. Archives of ophthalmology, 76(2), 189-194. Choudat, D., Neukirch, F., Brochard, P., Barrat, G., Marsac, J., Conso, F., & Philbert, M. (1988). Allergy and occupational exposure to hydroquinone and to methionine. British journal of industrial medicine, 45(6), 376-380. Environmental Working Group. Skin Deep. Product search for Physicians Complex 6% Skin Bleaching Cream owned by CosMed. Online at www.cosmeticsdatabase.com. Accessed July 23, 2008.